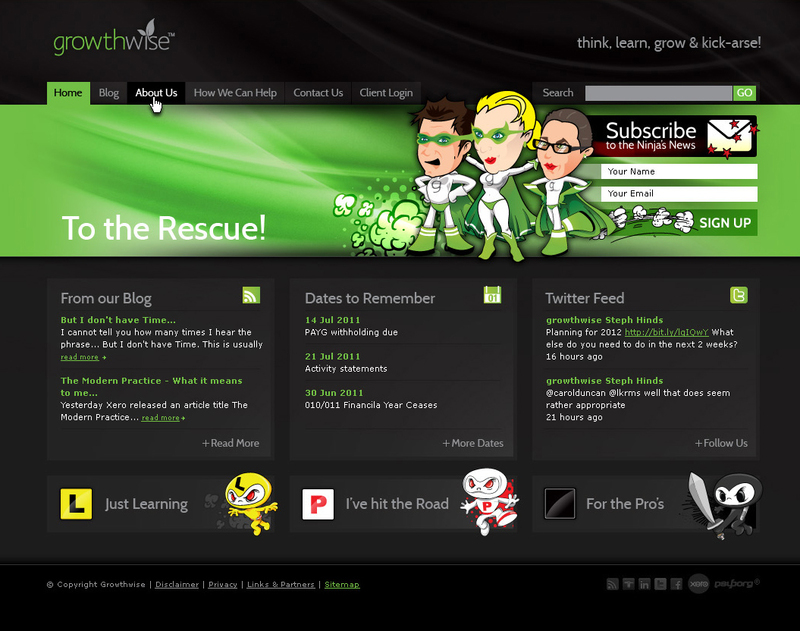 Recently, I had the pleasure to collaborate with Steph Hinds, Alan Spicer, Kristy Williams and the rest of the Growthwise team. I was asked to help them with there branding, website, email and environmental graphics. I originally created the Growthwise brand and as the team have grown considerably, it was now time to expand their brand in new directions. 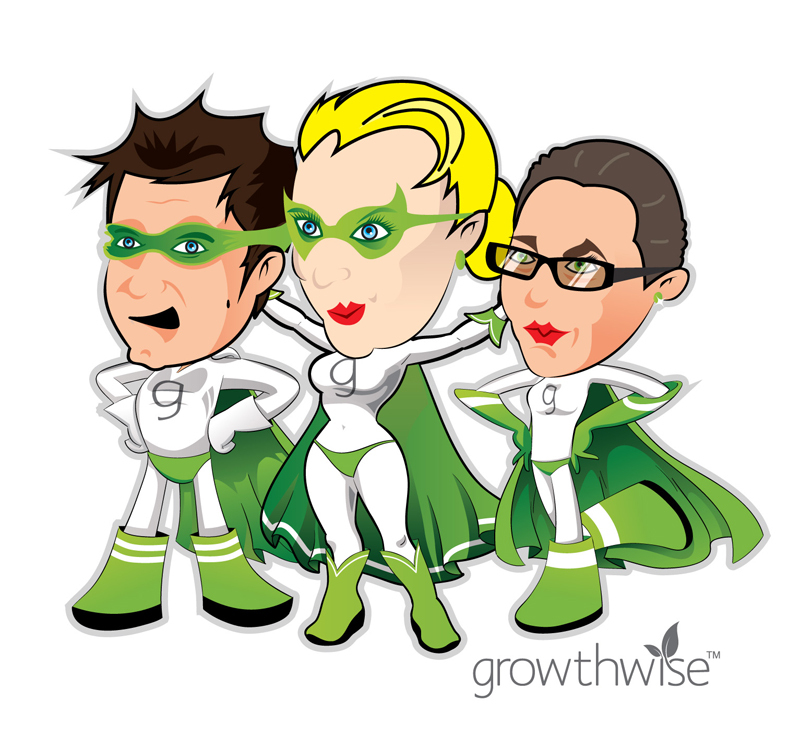 Growthwise are a young and vibrant accounting firm located in the heart of Newcastle, servicing a vast range of innovative and dynamic clients. Steph and her team are a pretty innovative bunch… they are savvy with social media, cloud computing and provide interesting methods of helping their clients grow. Growthwise run an innovative program known as the ‘Ninja Program’ where they educate their clients through different levels of achievement known as the L-Plater, P-Plater and Black Ninja classes. Each Ninja progresses through various skill sets as they grow and eventually graduate to a Black Ninja. 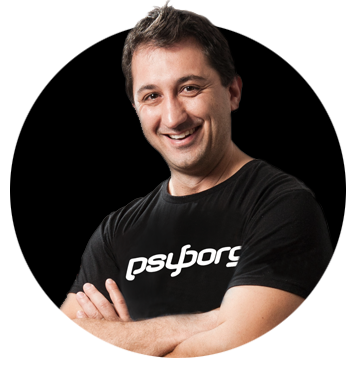 Growthwise came to psyborg® with this vision and requested that we create a visual metaphor to help explain these concepts and processes presented in social media, the web and in their own environment. With a core message of ‘Think, Learn, Grow & Kick Arse’ we created a Superhero vs Ninja concept showing the world that these are not your ordinary accountants. 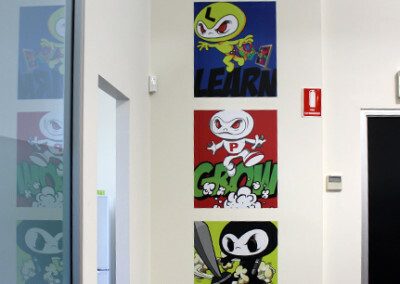 I designed the staff members as superhero’s and created some ninja characters for the three levels of clientèle. 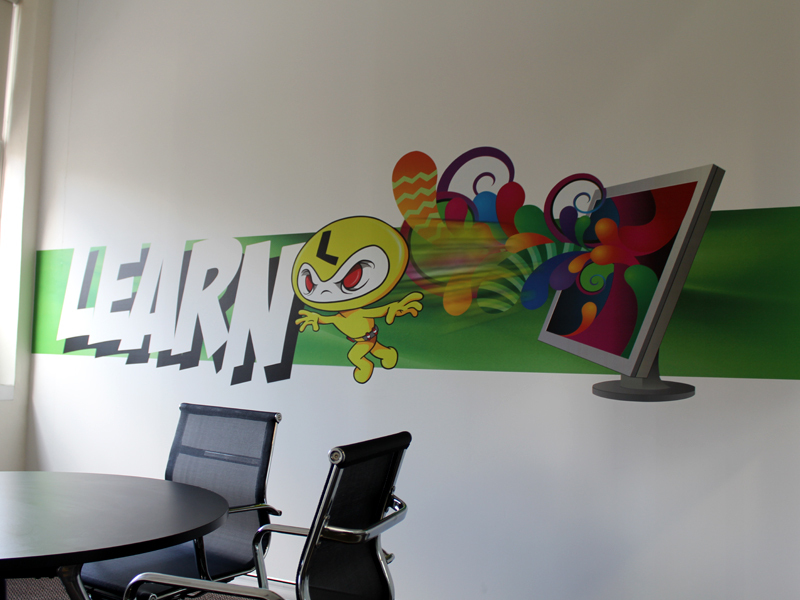 The caricatures were used as social media avatars for the staff at Growthwise, on the Growthwise website; assisting in explaining their programmes, email newsletter templates and as environment graphics on the office walls. 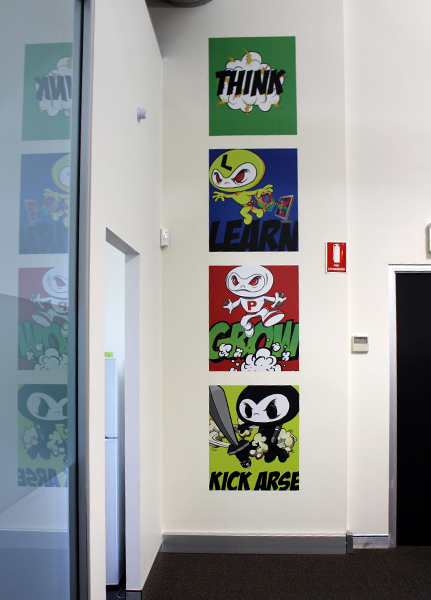 In designing the office graphics we tailored each room so that the elements of ‘Think, Learn, Grow & Kick Arse’ would be represented whilst portraying the different stages of growth. 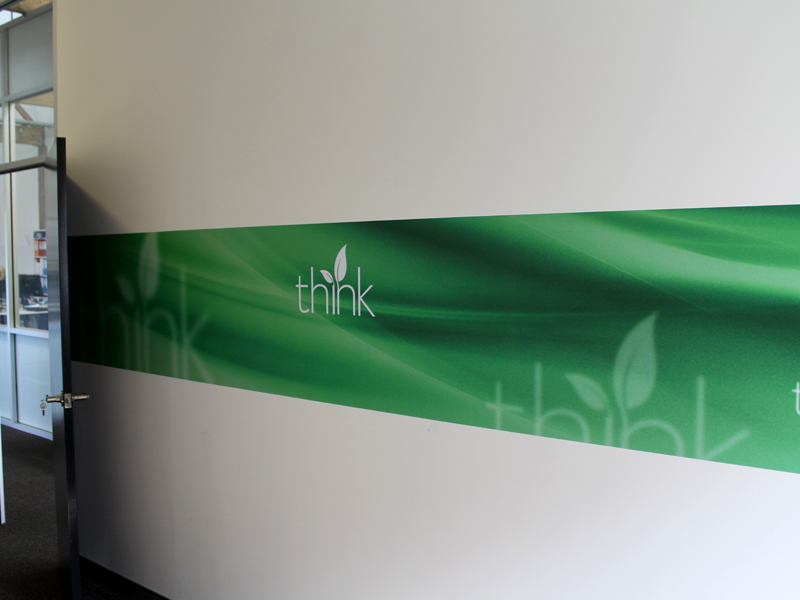 We chose to use ‘Think’ as the board room environmental graphic. 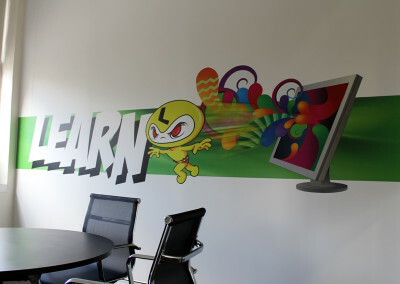 This is the most subtle of the graphics and is neutral in tone, used to promote thinking, brainstorming and discussion. This is where new clients visit first so we wanted to ensure these graphics were conservative… we did not want to scare away new clients. 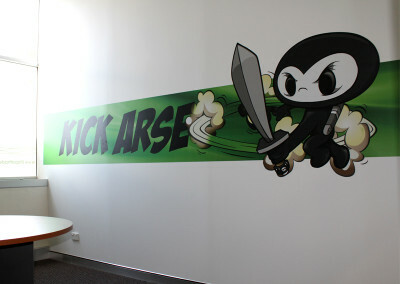 We then introduced, each ninja in the remaining three conference rooms in the hope of injecting some spirit in the conversations to be had. 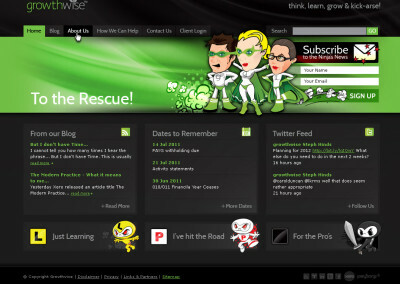 We combined these four designs with a green futuristic stripe linking all of the rooms, the website, email newsletter templates and the Growthwise brand. 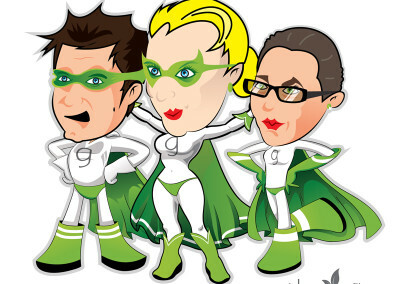 We also ensured that the superhero characters were not used in the office graphics as we did not want the staff looking at them selves all day. This concept and execution goes a long way to differentiate Growthwise as an innovative and forward thinking accountancy & business advisory firm. The environmental graphics give energy and colour to the office instantly communicating personality, technology and their vision. The graphics promote action which is at the core of business success. 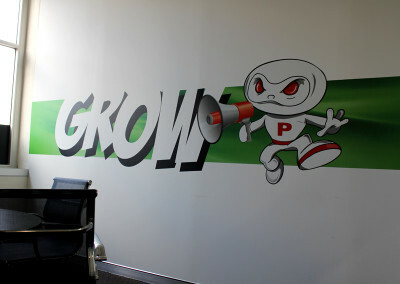 A huge thanks must go out to Steph and the Growthwise team for collaborating with psyborg® on this project as their vision and attitudes have been rewarding and we are enjoying learning about the various reactions and new directions this creative approach is taking.